High speed Satellite internet straight to your home or small business no matter where you are. 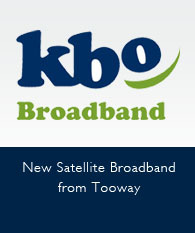 KBO Broadband connects your computer to the internet via a high speed connection with the new Ka Sat Tooway Satellite Broadband. We can offer you speeds up to 10.2 Mbps download, and 4.1 Mbps upload wherever you are located. Flexible rates to suit every budget. KBO Broadband is designed for individuals, home offices and small business . 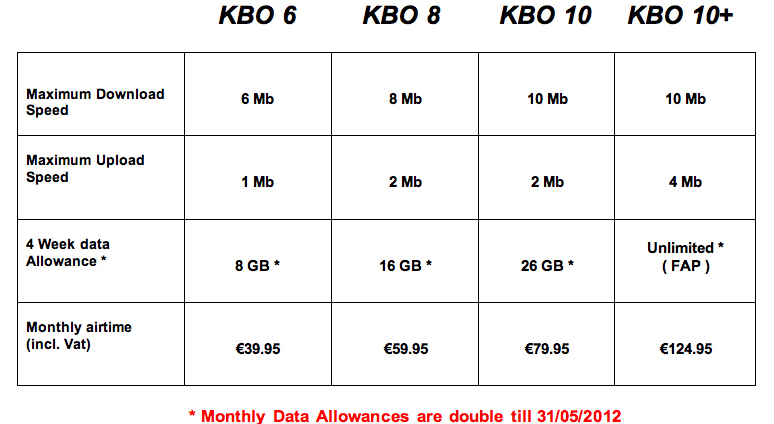 From just €1.00 per day (inc. vat), there is a KBO Broadband package to suit you. Telephone services are also available with no line rental charges. AV Services can supply you with a wireless router to enable you to share the internet connection throughout your home for laptops and smart phones. KBO Broadband guarantees you 100% fast internet coverage across all of Ireland It is available now from AV Services. This means no more waiting for expensive networks to be built where you live. This service is especially suitable for rural areas where ADSL or Fixed Wireless is not available. Plug it in and you’re good to go. Getting online with KBO Broadband couldn’t be easier. All you need is a small satellite dish on the outside of your home or office and a router box inside. One of our fully trained engineers will book an appointment to meet with you and carry out the installation. All you have to do is plug in your computer and you’re on line – it really is that easy! No phone line is required (therefore no line rental) and can be left on 24/7 just like regular broadband.